It was billed as one of the biggest days in Sussex Non-League football for 20 (20!) years. A team based in the east end of Brighton in the semi final of the FA Vase against Wroxham aka The Yachtsman from Norfolk. Wroxham the holiday village on the doorstep of the Norfolk Broads against Whitehawk, the estate that rivals Moulsecoomb for the title of Brighton's "finest" suburb. Game on. Bricking it. A fancy bit of work above the bar in the new clubhouse. ...and the odd EFW apprentice. It's only the actual FA Vase. EFW legend Sam Crabb. Shamefully left on the bench until the 85th minute. Tsk. So what were my credentials for hopping on board the Hawks bandwagon? Well *thinking quickly* I only live 3 miles from the ground (tick) and thus I was able to walk to the ground - which means there is 0.8m Man Utd fans who can't have a pop (cheap gag that - Ed). I'm also their lucky mascot having seen them win their first trophy for umpty thrumpty years last season when they won the Sussex County Cup. Thirdly, I give you Sam Crabb. Crabby is the EFW sponsored player this season. I signed him up for Lewes but he moved to Whitehawk midway through the season. Crabby's move highlights the fact that Whitehawk actually have more money than Lewes. They are backed by a couple of wealthy types and are very much a club on the up. 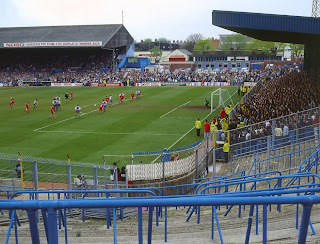 For this game their average home crowd was 10x the norm with 1,331 punters putting 6GBP each into a plastic pint pot upon entering the Enclosed Ground. The odd 31 were made up of the travelling contingent from Norfolk. Fair play to them. The last time this ground was full was for an FA Vase match with Truro a couple of seasons back. On that day a minor bit of crowd trouble marred the day and took the headlines. Pleasingly, everyone was on their best behaviour for this cup tie and the club will have done themselves the world of good in terms of publicity, despite the result. The ground is also one of the more picturesque you'll find in Sussex and no mistake. Well worth the visit. The first thing you notice as you enter the ground is the exaggerated slope of the pitch. Mmm....a sloping pitch which invoked memories of classic cup ties of yesteryear at the likes of Barnet and Yeovil. Not only is the pitch a sloper but the main stand is wonky as well. I'd had my fill of Guinness when I took up my position on the terracing/muddy banks granted but someone else will confirm the slopage factor of this ground I'm sure. It's up in the high 70's. The crowd was made up of mainly Brighton & Hove Albion fans buoyed by their recent form as well as representatives from lots of Non-League clubs around Sussex. There was also a large EFW contingent with friends from Shrewsbury Town, Bournemouth and The Lewes Lunatic Fringe present. Even the infamous Merstham ultras had put in a Sunday shift. Phwoar! 1 x sloping main stand. Tick. An actual "white hawk" carved into the hills by local artists in 2001. The ref leads the charge to the bar for a half time pint. The most scenic throw-in of the season? Aside from a trip to Wembley, the talk of the terracing/muddy banks was the corn beef vol au Vents in the VIP tent beforehand. How the other half (FA suits mainly) live eh!? With these players being of the County League persuasion we were also hoping to see some players the size of bus in the belly department. As it was, Hawks joint-gaffer George Parris took the stakes by virtue of the fact he is now the width of 2 x Micky Quinns. So what of the match? It has to be said Whitehawk fluffed their lines. The first half was fairly drab as nerves and the bobbly surface made things difficult for both sides. In the second half Wroxham and in particular Steve "Spriggsy" Spriggs began to turn the screw for the underdogs. Paul Cook put his noggin to good use by heading their opener just seconds after the break and Andy Eastaugh's 25 yard screamer put the gloss on the away sides 2-0 win. Whitehawk's best moment came courtesy of a dipping shot from Danny Davis who rattled the bar in the first half and their worst came in injury time when the other joint-gaffer Darren Freemen was sent for an early bath by virtue of a rouge elbow into one of the oppositions boatrace - allegedly. One goal would have set the second leg up nicely. As it is, Wroxham now look favourites to join possibly Vase specialists Whitley Bay at Wembley. Good luck to them. EFW Man of the Match "Spriggsy". Big Mac, fries to go...it's Georgie Parris. Eight months ago, EFW dipped a toe into the MLS for the first time by running a Q&A with the editor of Prost Amerika - the influential website attached to the Seattle Sounders. What followed took me a little bit by surprise. Comments on that article still flood into EFW HQ to this day as fans of both the Sounders and their rivals Portland Timbers have a "friendly" little pop at each other. Where would football be without healthy rivalry eh!? Initially, I regarded "soccerball" - as some Brits occasionally call it - as a bit of a joke. I'll freely admit that the only reason I began writing about it was to try and get a generous fatcat chairman of one of the clubs onside. The reason? A shameless wish that he'd send EFW 2 x flight tickets to come over and cover a matchday experience (actually, we're still holding out for that, just think of the publicity - Ed). The feedback on the Sounders v Timbers shenanigans though convinced us that this was a game that shouldn't be missed. As such, we've genuinely pencilled it into our 2011 schedule. Arguably the best signing the Sounders made in pre-season was our very own Arlo White from the BBC. White, who was a stable on the Radio Five Live football coverage has become the new "voice of the Sounders". It's a long way from his beloved Leicester City but he seems to have seattled (sic) in quite nicely thankyou very much. Good luck Arlo lad! It's been eight months since we last covered the Seattle Sounders on EFW, you've had a bit of success since then I gather? Absolutely. 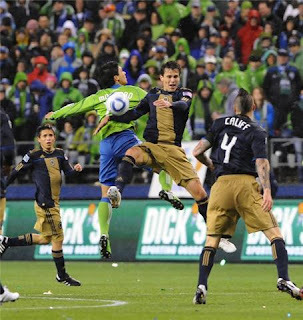 Sounders FC won the US Open Cup, the American equivalent of the FA Cup. It was a fantastic night in Washington DC. It was Sounders first success in a tournament they also entered as a minor league club, but to win a trophy in their first year as an MLS club was fantastic. The club also became the first expansion side to make the play-offs in Season 1 for over a decade, but lost to Houston over two legs. It wasn't a bad first year, but everyone here is hungry for more success. That must have been quite a night? Hell yeah. After the game, I was given access to the dressing room and interviewed just about everybody for a Cup Final podcast. Freddie Ljungberg expressed his joy in Swedish and comedian Drew Carey and US goalkeeping legend Kasey Keller also contributed. Thanks especially to Freddie who pulled me out the way just as Jamaican international centre-half Tyrone Marshall was about to drench me in champagne. If you get close enough to them, Sounders FC can be a very close and welcoming club. After the game and filing a massive match report, I met some of the traveling fans in the bar. Many of them are guys I stood on the terrace with in the old days. They were doing the stuff that European fans take for granted on 3000 mile trips, kipping on airport floors, finding beer at 3 in the morning, lending and borrowing believable excuses for missing work the next day. Quite a night. Funny thing was, the night before the match I was given access to the players in the team hotels. Long time club servant Roger Levesque wasn't one of those scheduled for interview but he came up and talked to me anyway as he always does. We were doubtful we could use it, as we didn't think he would play, but we ran the story anyway. Roger not only played, he scored the second goal. 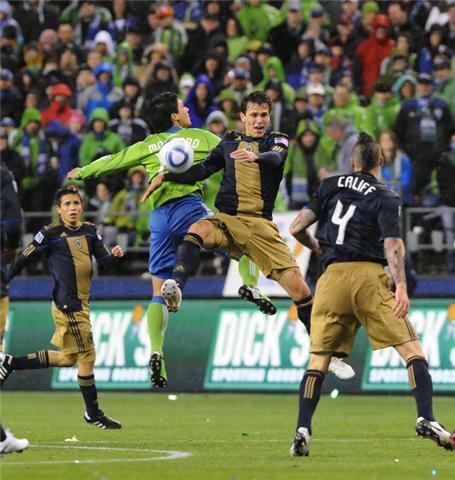 Sounders Fredy Montero & Union's Stefan Miglioranzi jump for joy at the seasons opener in Seattle this week. What's this CONCACAF Champions League all about then? It's the North and Central American equivalent of the Champions League. Sounders cup victory grants them a place in the pre-qualifiers. Sadly, MLS sides do not always treat it with the respect it deserves, and it is clearly not as prestigious as the UEFA equivalent. The problem MLS clubs have is the roster size stipulation. Clubs are only (currently) allowed 24 players on their roster and this makes putting out strong squads for every game a juggling act. Many MLS clubs de-prioritise the CONCACAF cup and focus on MLS instead. I think Sounders might be different though, because I suspect a deep seated ambition to play on the global stage and that means being a hit in CONCACAF. They have to play a two-legged qualifier first before the group stage. That happens last week of July, so stay tuned. I find it incredible that Jack Warner is still in charge of CONCACAF after a list of (reported) misdemeanors as long as your arm don't you? Is he still doing Dixon of Dock Green? Being in the CONCACAF Champions League can only further raise your profile surely? The honeymoon seems never ending at the moment. It will definitely raise the profile if Sounders win it. Being hammered by Joe Public (yes that is the real name of a team) won't really, I wouldn't agree quite about the honey moon. The fans on the chat boards are being a little more critical than last season, and the club can't expect the journalistic silence of last year when they make mistakes. There was a general but unspoken agreement to cut them a break in year one if they did so. If they repeat them however, I think it may be more public this year. It is funny because it's true. I give you Joe Public FC - Ed). 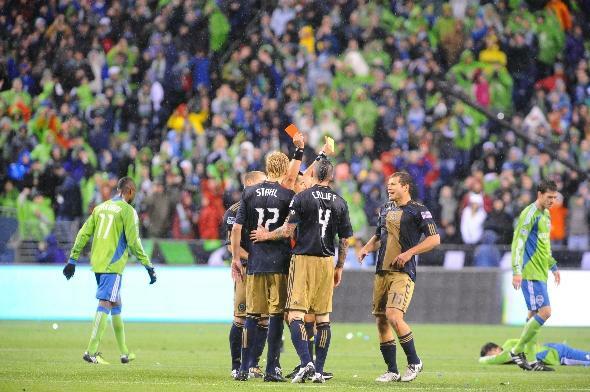 Union's Toni Stahl sees his second yellow AND a red during the Sounders 2-0 victory this week. Personally, I can't wait until the 2011 MLS season when the Sounders can renew their rivalry with the Portland Timbers on the pitch. Is that (rivalry) still as intense as ever? I'm really looking forward to the arrival of both Portland and Vancouver. Both are great clubs with great and committed fans. The Timbers Army will bring something fresh and energetic to MLS, and have done a wonderful job keeping football at the core of life in their city. Vancouver Whitecaps have been adding some serious experience to their Front Office staff and already have a youth set up, called the Residency Scheme which is the envy of many. Prost Amerika hopes to increase its coverage of both clubs in the run up to their MLS entry. I' m already looking for people in both cities to help with match day coverage. I'd love to have match reporter and cameraman there if anybody's interested. The rivalry isn't like the Swansea/Cardiff or Portsmouth/Southampton thing. Those four cities have economic and political differences that go back centuries. There's a few on message boards who like to make out the rivalry is World War 3 but the numbers who want to mimic Green Street are low, but of course loud. (They'll be arriving shortly on the comments section of this interview to proclaim the severity of their hatred but it isn't like that for 99% of us). Besides, aren't we all tough as old boots armed with a keyboard? It should be noted that the respective largest fan groups of Portland and Seattle played a friendly on March 28th, and communicate frequently on matters of mutual interest. A prominent Timbers Army leader was happy to guest on the Radio Sounders Show. If I had to compare it to any English rivalry, I'd say the Portland v Seattle rivalry is not unlike East Anglia in its intensity. Of course, Seattle having Vancouver as a second rival waters that down slightly. The rivalry with Vancouver is more amiable than the one with Portland, but Canadians are just plain friendly at the worst of times. The Whitecaps are really hard to dislike as are Canadians in general. Football focus. A Sounders ballboy keeps his eye on the job in hand. It is a shame you no longer contest in the Cascadia Cup. Was that as good as it sounds with the Sounders-Timbers-Whitecaps round robin of matches? The dream was always to have it while playing at the top level. The two year gap without it will be worth it to fulfill that dream. Nonetheless, my friends in the Front Office at Vancouver did like to send me the occasional picture of the Cup once in a while, until they lost it to Portland - who I'm sure will send me a picture of it draped in green and yellow ribbons as soon as they see this interview. Your MLS season kicked off this week with an opening fixture against Philadelphia Union. That was their first ever fixture wasn't it? Yes, their first competitive game ever. How often do you get to see something like that? Another franchise team then. This seems to be the way forwards in the MLS no? In 2011, two existing clubs Portland and Vancouver enter MLS. Montreal Impact are pretty certain to be next. So the next three won't be new clubs as such, but clubs with long traditions and a social and cultural presence in their cities. After that, I suspect, there will be one further addition to take the league to 20. News reaches this side of the pond that you've sold a wheelbarrow full of season tickets for the new season. Anticipation must be at fever pitch? The hit numbers on my website are astronomical. 32,000 season tickets have been sold and the club is capping it at that, They could probably have sold more, but that would have required opening the Upper Tier of the stadium, a move the club remains reluctant to make. Is Freddie Ljungberg sticking around? He arrived back in late January and is committed to the club. He also has a dog called Amadeus if you're interested? Yes, here he is and there is another photo here. After Chelsea and Barcelona last season, do you have any more prestigious friendly matches with European opposition lined up for this season? Nothing declared as yet although respected bloggers have made it reasonably clear the club should steer away from guests with racist baggage in a progressive city like Seattle. Every fan group I've spoken to is in agreement so one would hope you could at least rule a few out. We do know there are three friendlies added to the season ticket package so fingers crossed for a big EPL side, and a Serie A side. Maybe even Lewes. How do see the new season going? The Western Conference will be very competitive. Houston have lost two key players in Stuart Holden and Ricardo Clark, and LA will be without Beckham, so Sounders and Chivas USA should be able to narrow the gap, especially Sounders playing in their second year, and adding Swiss international Blaise Nkufo after the World Cup. Real Salt Lake had an average regular season but timed their run right to win the play-offs. I expect their regular season form will improve slightly too, as everyone now believes Jason Kreis to be a genius. Dallas finished the season very strongly and if Jeff Cunningham starts as he finished may surprise a few in the West. Sounders need to extract more out of talented stars like Steve Zakuani and Nate Jaqua who are both young and should be on the upward curve. They also need to hope Osvaldo Alonso remains in stellar form. If they drop their standards any, there will be a host of challengers on their shoulders. In the East, New York are bound to be better, especially with the inspiration of a cracking new stadium, not to mention a new coach. I expect Columbus Crew won't be worse than last year. After all, they walked the regular season (known as the Supporters Shield), despite failing to win in their first seven, in a 30 game sprint. Chicago should improve but I suspect DC United's struggles may continue. Their best close season signing is their Media Guy! Philadelphia in their first year may be more of an expansion side than Seattle were. New England will remain tough to beat but the loss of talisman and legend Steve Ralston will be felt throughout the club. Although it would be nice to see Toronto, Kansas and San Jose improve, there are more signs of improvement at other clubs around them, and all three have lost a veteran who seemed, at least from the outside, to be inspirational including your compatriot Darren Huckerby. Thanks to Rick Morrison/MLS Examiner for the photos. Bishop's Stortford, huh, yeah, what is it good for? Absolutely loads of things, say it again, y'all. Where to start? Yes, yes, market town next Stansted Airport. Of course, home to a young rebellious Russell Brand in his boarding school days (he got expelled obviously) and I'll even give you Radio 1's Greg James who is a resident. EFW readers will at this point be thrusting their arms into the air, saying “sir! sir! sir!” in their eagerness to point out that despite Brand, James and planes; the real reason Bishop's Stortford are on the tip of most people's tongues these days is the fans of their football team The Bishops or if you will The Blues. Blues fans are known to be very loud and are also well known throughout the league for their witty chanting and their chants have appeared on a number of occasions on the BBC Sports's 'Chants of the Season' section. I guess you'll be wanting an award winning example now won't you? Here we go then; to the tune of Toni Basil's Hey Mickey - they once sung to St Albans goalkeeper Nick Eyre: "Hey Nicky you're so fine, you're so fine, you're two behind, hey Nicky!" Worthy of a two hour train trip to Woodside Park to see Lewes take them on then? Yes siree, not arf. The EFW Team suffered a minor setback upon our arrival to CM23 just under 4 hours before kick off. The pub we'd pencilled in for our pre-match beer and darts (Jolly Brewers) wasn't open. What to do in a moment of crisis? Join the Bishop's Stortford Working Mens Club next door? Of course. We can be quite resourceful at times. So we grabbed a local to sign us in and flashed our union cards for further proof of our working class roots and Bob was indeed our Uncle. In you come lads. £2.20 a pint ok for you? I'll switch the light on for the dart board shall I?. Absolutely everybody in the pub was up for a chat. They were all over talking about football, football, football, Cheltenham Festival, football and a bit of football. A plaque on the wall proudly boasted the fully deserved title of Britain's loudest and hottest pub. An award they'd picked up for four years running. After 21 legs of darts, a few rounds and a wave to all and sundry we were on our merry way. We made it as far as the Rose and Crown opposite the station. A traditional local that has been spoilt by an unnecessary refurbishment (ie dart board removed, swanky sofas inserted and wooden floorboards installed). A very swift pint later and we taxied our way into the Eddie Bentley Lounge at Woodside Park, home to Bishop's Stortford FC or Bishop's Stortfort FC as the welcoming mat would have it be known. Our friends at The Ball is Round Blog had sponsored the match and as such we had a little bit of fun in the boardroom beforehand. Stuart, the head poncho of TBIR had arranged for his two daughters to be matchday mascots for the afternoon - Dad of the Year Gong in the post as we speak. Heavenly biscuits were on offer which compensated for the lack of beer. Non-League football and biscuits go hand in hand. Check out the Rothmans Guide to Non-League Biscuits Volume 12 if you can grab hold of a copy. Priceless. TBIR mascots Lolly and Islabella Fuller get ready to rumble. Frank "Ponch" Poncherello and Larry Wilcox aka Officer Jon Baker non plussed. What of the match then Lasty!? I can sum that up in one letter - ZZZZzzzz......Good Lord it was dull. Two teams hopelessly out of form served up a chess match that Garry Kasparov and Nigel Short would have been proud of. I suppose for two teams sporting the nicknames "The Bishops" and "The Rooks" it was about par for the course. Checkmate? Lewes dominated proceedings after The Blues were reduced to 10 men midway through the second half but it was an all too familiar story of bags of possession and no end product. We're keeping the faith though here at EFW HQ. I for one won't mention the fact that we got rid of my sponsored player Sam Crabb - who knew where the goal was - the same Sam Crabb who is a heartbeat away from Wembley by virtue of shooting Whitehawk to FA Vase glory. Not my style mate. See you on Sunday for the semi-final Crabby - he said bleating on about Sam Crabb. It wasn't all bad though. Firstly, the guy who spins the wheels of steel over the PA system at the Woodside pumped out an ironic version of "Heaven Knows I'm Miserable Now" by The Smiths at the final whistle. Secondly, the EFW Team had rang ahead and donated 15GBP to Sports Relief for the over exposed James Corden NOT to appear during the ninety plus minutes. Everyone is a winner. Cheers! Man alive Mr Sackey! Have you not read our Odense BK report!? Click HERE to do so. Have you ever seen a ref so happy to book a player? He sent him off later on. As we were next to Stansted Airport, I had an award winning photo of a floodlight and a plane in mind. 1 FIFA star for this effort? Low cloud cover is my only - very lame - excuse. The lino about to swing a fast boot. Letter of complaint to FIFA in the post as I type. Game on, Barney to throw first. LLF in the background soaking up every minute. Cynical Dave's post match reaction. And finally (phew - Ed) joking aside, it was a brolly good show. Keep the faith and see you next week. 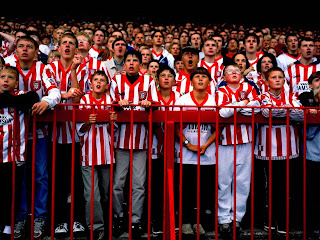 Photographer Stuart Clarke has been capturing the changing face of football through a lens for over 20 years. His ongoing Homes of Football exhibition has been running ever since and in 2012, a collection of his work is set to grace the new National Football Museum in Manchester. Clarke has been hugely influential not just on some of my work but on pretty much every football website owner and photographer I've ever spoken to. If you love this sport, you'll love the Homes of Football website. Type your teams name in the search engine and you'll be instantly hooked. 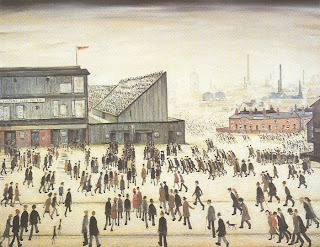 Personally, I fell in love with football after spending too long in my youth staring at a copy of L.S.Lowry's "Going To The Match" that my parents had hanging from a wall. Clarke's photographs have managed to bring the magic of that painting into real life. He does indeed give the fan a voice. L.S. Lowry and his "Going To The Match" masterpiece. You've focused on fan's experiences of football from World Cups to grass roots, do you have a preference on the level of matches you photograph? I like matches at all levels. The BIG games have the feeling that everyone is watching (on tv) and I can send a postcard home; the SMALL games have that intimacy. What is the best event you've covered? Euro'96 in England, Japan 2002 and Portugal Euro 2004, all tied. Watford beating Bolton in the Play-Offs at old Wembley 1999 ...and France beating Brazil World Cup 1998 as one-day events. Is there an event that you'd like to photograph that you haven't already? As corny as it sounds : a match that takes you by surprise - it may be a big or a small match. You must get sick of "favourites" questions but erm...do you have a favourite photograph? "Cry For Home" at Greenock Morton, 1995. Football's romance against a backdrop of reality. 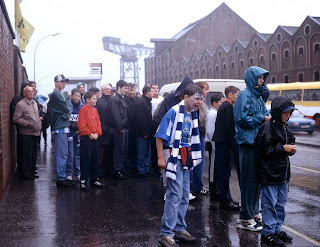 "Cry For Home" taken outside a freezing cold Cappielow, Greenock Morton in 1995. Do you have a favourite ground? Turf Moor Burnley, for photographing. Brunton Park, Carlisle and Shepherdsbridge at Coniston, for being 'home'. Why is photography so special to you? Captures a moment in time and represents that moment as something more permanent that you can look on many times ... and touch. 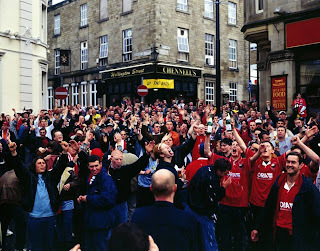 Barnsley fans "Drinking Red Champagne In T'town Square (UP THE REDS)"
It is a pretty competitive marketplace these days no? It always was I think. EVERYBODY in the World has a camera and takes pictures. Not many people write or paint. My photography has to look like... but stand out in the crowd. Do you get a chance to actually enjoy the games you attend or does the pressure of work take that away somewhat? I love almost every moment - from 5 hours before the game when I arrive... the first half is tense because there is a lot to work out (positions, possible photographs, key players). The Homes of Football is one of the longest touring art exhibitions in British History. You must be very proud of that fact? It's the longest! Yes I am proud but it's all just been a warm-up to what I am about to achieve! 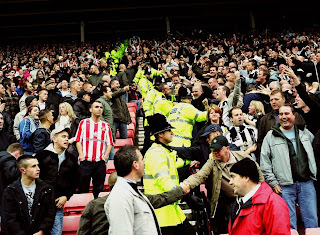 "A Hand Across The Rivarly" Sunderland v Newcastle in 2007. Are you into any other sports? I cry at almost any long-distance running, love watching skiing and the Grand National on tv and i am a swimmer of lakes, rivers, sea. Hope golf dies a natural death, but have got over wanting the same for rugby and cricket. A lot of current sports photographers I talk to cite you as an influence on their work, who were your influences? War photographer Donald McCullin, humourist Elliot Erwitt, Portraitist August Sander, road-tripper Robert Frank, film-maker Charlie Chaplin. Has the ease of digital made your life a whole lot easier or do you stick to traditional methods? Have not yet explored Digital photography and may never. I love to have 'a piece of film' in my hand, alongside its likeness as a digital file. Love email and twitter. "Never Take The Goldstone" Brighton v Millwall in 1991. I've included this one purely for selfish reasons because I'd have been at this game in the North Stand to the right, down the front, slightly left of the goal. Somewhere I stood for 15 years or more. Why did you only take half a dozen photos at Italia90? Is that where you first got the inspiration of photographing the crowds at football rather than the action? I had my girlfriend with me! Yes, I did not want to be shutter-happy and take holiday-snaps. Your website is sponsored by the PFA but the members (players) of that organisation are seemingly only photographed by you in the context of the stadium and crowds. Is that just a personal preference? I love that anomaly that my biggest supporter bar none is Gordon Taylor/The PFA , who hardly ever get a look-in except in the context of the whole match spectacle. But that is why he/they like it I think. They were supporters once and will be again. Do you have any of your work in the Museum of Football? The entire collection shall be housed there from 2012. It has to be protected somewhere. It's a national treasure. I pinch myself that i have had something to do with finding it. 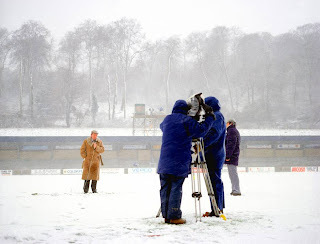 "Reporting From The Ground" at Wycombe in 1990. An image that Motty says launched his sheepskin coat into superstardom. Are you off to South Africa for the World Cup? I am doing it differently this year. To be accredited you have to be there 5 weeks from before start until after. I can't do that. I have a 4 year old daughter and I also want to see some of the World Cup back on English soil. But I will doubtless be there at some point and I went there when the stadia were being built. Finally, if you need a bungling amateur to write irreverent swathes of text to accompany your fantastic photos of matchday experiences then I'm your man Mr Clarke! Yes, I would like that at some juncture so let's do it next March (1 year's time). stay in touch. Fans of Twitter can follow both Stuart Clarke and Homes of Football both of which are hugely entertaining.